Even though I don't have a specific project in mind, I've been wanting to take a look at various products and their effect on paper. I like the way a thin coating or epoxy resin or polyester resin will turn paper into a somewhat stiff translucent sheet. But I've never been too crazy about what a mess resins can be, or how much of a pain it can be to mix up a small batch and get the proportions exactly right. If you don't get it just right, the surface of your paper stays sticky...forever. 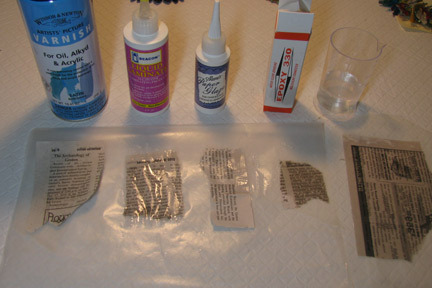 So I tested the five products shown above, all on newsprint: spray varnish, Liquid Laminate, Paper Glaze, quick drying epoxy resin, and clear silicone. As expected, the resin yielded an easy to handle translucent paper that was stiff enough to keep it's shape but could also be cut with scissors as long as the coating wasn't too thick. Surprisingly, neither the Paper Glaze nor the Liquid Laminate worked at all. I used the spray varnish almost as a control, and neither of the other two products looked much different once they had dried on the paper. The other product that worked well was the clear silicone. I wasn't sure if it would, since silicone is notorious for not sticking to anything (making it the perfect mold material!). 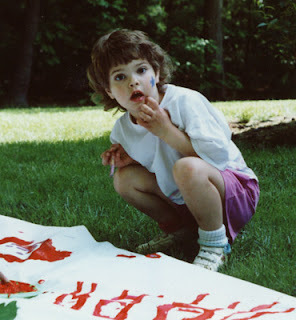 In this case, though, the silicone penetrated the paper and yielded a wonderful translucence and also...flexibility. 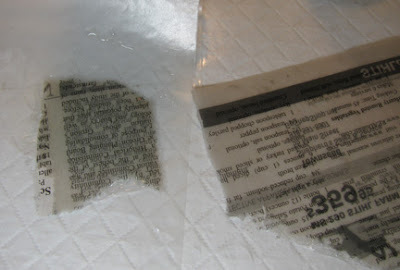 The paper treated with silicone looked much like the resin one, but it was easier to cut and could be bent and folded easily. So what does this all mean? I'm not sure. I will keep this tucked in the back of my mind though, and it may well end up figuring into some future project. Or maybe you can think of an application right now...? I love that people like you get scientific, you make our choices of materials to use so much easier. I am more the "Jump in Head First and make lemonade out of your lemons type" LOL I will stick to two part resin for now. Thanks for the info and inspiration! Thanks so much for sharing your experiment results. I have a question. Is the silicone like the clear silicone sealant ( http://www.amazon.com/gp/product/B0002BBX3U/ref=pd_lpo_k2_dp_sr_3?pf_rd_p=486539851&pf_rd_s=lpo-top-stripe-1&pf_rd_t=201&pf_rd_i=B000BD0QAK&pf_rd_m=ATVPDKIKX0DER&pf_rd_r=0YH69GNY10R0SS1WAQ3F )? In your image, it looked like a glass of water. hi Cyndi, Interesting - what was the name of the silicone product you used? As an Aussie I have to try and work out what our local equivalent is. I like that it was still flexible! I have managed a translucent effect with Atelier Binder Emulsion, quite by accident, and while the end result appears very solid (it was a tissue collage), I was able to hand embroider into it, bend and distort it without any visible effect on the surface. These things are always useful to file away for future use, so thank you for sharing! Hi Caroline and RoByn! I used a two-part silicone from Smooth-On.com called silicone rubber. RoByn, the LocTite product is a single part formula, but I would try it first since it must be immeasurably cheaper than the stuff I used. Spread it thin and see what happens. Caroline, maybe you can find the LocTite product that Robyn mentioned. What I like about the Smooth-On product is that it dries crystal clear. What I don't like is the price! Thanks for the info on Binder Emulsion, Caroline...I've never heard of it! I'll have wait to get to home depot until our blizzard passes! Very interesting. Thanks for sharing the results with us, Cyndi I think you're right - someday this will come in handy.